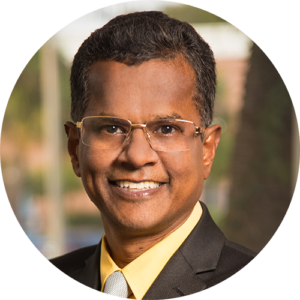 Dr. Balakrishnan Krishnan is currently an Associate Director of Research and Technology Services at BRIDG. He has more than 25 years of research experience in various aspects of III-V and III-Nitride Semiconductors. After earning his Ph.D. in Semiconductor Physics (Crystal Growth and Characterization) from Anna University, India, in 1992, Dr. Krishnan moved to Japan and did extensive research on III-nitride & III-V epitaxy and devices. From 2007 until 2010 he served as a faculty at the University of South Carolina and during this period he continued to focus on MOCVD growth of nitride semiconductors and devices. Later, he worked as a Senior Research Scientist and Technology Lead at Veeco Instruments. As a part of his assignment, he collaborated with many of the world’s leading GaN based optoelectronic and electronic device manufacturers/suppliers, and research institutions on MOCVD projects. He is also a consultant for Nitek Inc. and Alliance MOCVD. Dr. Krishnan is the author of 148 journal publications, 10 book chapters, and 260 conference presentations (including 26 invited lectures). He is the reviewer for several technical journals and is a member of many professional societies including Materials Research Society and American Association for Crystal Growth.